Eubronet (European Brokers Network) is a further network of partner brokers which take on risk on the international stage. 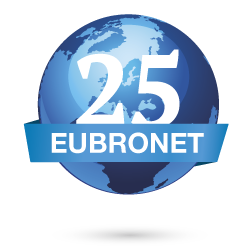 Launched in 1989 by the French brokerage AFCM (which has since been bought up by the brokers Verspieren), Eubronet brings together brokers from 15 European countries as well as one from the United States. These insurance firms are of very different sizes. All the broker partners know each other well which means it is a very amicable network in which each member feels free to express their opinions and ideas. They meet up once a year; this year the meeting took place in Turkey. Whatever the size of the firm the membership fee for the network is below € 1,000. As there are no employees it is exclusively driven by the members. A code of conduct was drawn up by all of the Eubronet members in which they promise the best possible service to the clients sent to them by their fellow members: “Because the Eubronet members know each other well and hold each other in high regard there is absolute trust when their business is handled by a partner broker in the network. The clients find this reassuring”, explains Alexandra Ganz-Cosby, the representative of the German Eubronet network and director of the international department of the Munich brokerage Artus AG. If a broker is not affiliated to the network but is “in need of help” with an international deal, they can turn to the members of Eubronet to approach a client as the network is open to working with other brokers. “Working with other cultures in the insurance business can only be learnt through experience. Compliance (the entire set of rules that need to be applied to conform to the demands and recommendations of a given country: editor’s note) is essential for the insurance business. It is also necessary to understand the law applicable at the local level as there are many grey areas which are not clear to foreigners and insurers and brokers have to conform to these very closely” says Alexandra Ganz-Cosby who also worked in the insurance business in Paris for ten years and in the United States for four years. For example Dubai is currently a huge market for foreign architects due to the large number of construction projects and finding a broker there is no simple matter. This is the real advantage of using the services of Eurobret. “Ultimately what really matters is the quality of the service which the client receives”, concludes the Eurobronet representative for Germany. In “Le livre Bleu 2013” on insurance brokers edited by Aprédia it is stated that “the majority of small and medium-sized insurance brokers still focus on a local market where they have been able to build up a reputation and gain appreciation in spite of the well established competition. The growth of their clientele results more typically from recommendations than from a proactive client search, an approach which in the long run few brokers are successful with.” Here (in France), the broker firms with a regional or departmental catchment area are often “forced” to work internationally as a result of their clients’ needs. The client provides the impetus, the broker follows. New demand gives rise to new supply. Alexandra Ganz-Cosby, Director of the international department of Artus AG and member of the Eubronet network. This is an article that the French insurance journal wrote about our network.